In this section, we provide some spectrograms of full-spectrum recordings of bush-crickets. An example recording of each species can be played to hear what different species sound like, and a larger sample of recordings can be downloaded. For identification, it is easiest to play back the recordings slowed down in time expansion as shown here. It is important to note that the speed at which individual stridulate varies with temperature – slower with decreasing temperature. Note that there are a few UK species that are missing. Some of these do stridulate (e.g. Oak bush-cricket Meconema thalassinum), or are currently very localised in their distribution in the UK for which I do not currently have reference recordings. This is a first attempt to provide some information on species identification for others who are working in full-spectrum, as little is documented elsewhere. We hope to continue to work and improve on this information, and would be interested in any feedback that might help. Multiple syllables (normally at least 5) isolated, short and high frequency (30-40 kHz, sometimes lower when cold). Note female also calls in response – normally shorter call sequence. Link to sample of full spectrum recordings (note will often contain other species, be of poor quality or contain distant calls of the focal species). Active evening and through the night, July to November. Peak frequency about 12 kHz. Isolated calls of 3 syllables (sometimes the first syllable is faint or missing). Peak frequency about 20 kHz. Simple continuous / regular calls. Active midday to mid-afternoon, but can be recorded during evening bat surveys and occasionally later in the night, July to October. Peak frequency about 10 kHz. Link to sample of full spectrum reference recordings (note will often contain other species, be of poor quality or contain distant calls of the focal species). Most active from early evening and through the night, July to November. Peak frequency about 26 kHz. 3 syllable calls (2 short calls, pause, followed by 1 longer duration call). Most active midday to mid-afternoon, but can be recorded early evening and occasionally later in the night, July to October. Peak frequency about 33 kHz. 4 syllable calls (of equal duration) often given for an extended period followed by shorter sequence of single calls. Most active midday to mid-afternoon, but can be heard early evening and occasionally later in the night, July to October. Peak frequency about 28 kHz. 3 or 4 (up to 6) grouped syllables. Active midday to mid-afternoon, from July to October. We have not quantified how active this species is during evening and night. Peak frequency about 23 kHz. Normally 4 or 5 grouped syllables in a repeated sequence, where calls show increasing intensity within the sequence. Active midday to mid-afternoon from July to October. We have some data to think that this species is active to some degree during the evening and night, but we have not quantified this. Not recorded from Norfolk, but present in neighbouring Suffolk. 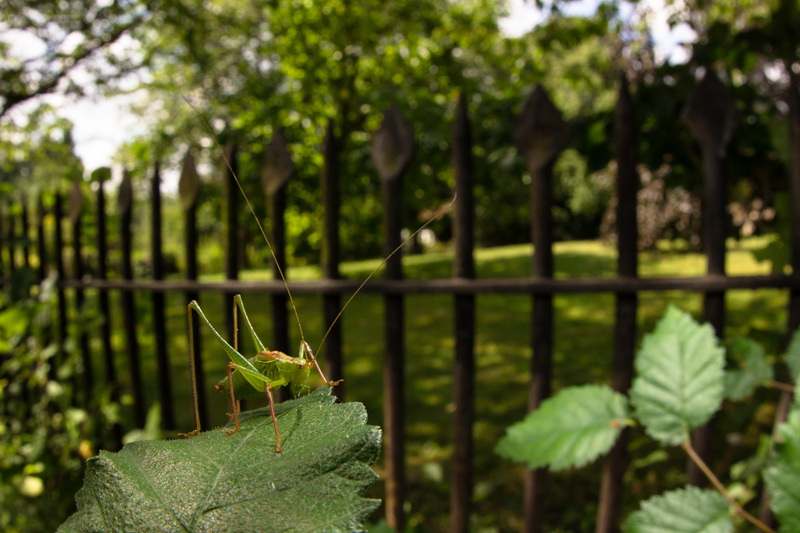 Note: example above also contains Roesel’s bush-cricket in the background. Newson, S. E., Bas, Y., Murray, A. & Gillings, S. 2017. Potential for coupling the monitoring of bush-crickets with established large-scale acoustic monitoring of bats. Methods in Ecology and Evolution View at journal website (DOI: 10.1111/2041-210X.12720). Ragge, D.R. & Reynold, W.J. 1998. The Songs of the Grasshoppers and Crickets of West Europe. Harley Books.